The Langhe and its natural treasures are particularly interesting in the fall season: truffle, hazelnut groves and the vineyards from which superb reds like Barolo, Barbaresco, Nebbiolo are born!! 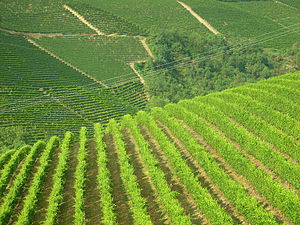 An experience full of sensual lust, wild nature but also regular vines as far as the eye can go! So let us going through the Langhe, a trip which follows the crest of the hills looking for the castles, churches, abbeys, villas, buildings, rural hamlets, groups of houses dating back to medieval times. Almost 85 kilometres starting from Alba the “capital” of the Langhe and “the city of a hundred towers”, going trough Diano d’Alba and from here reaching Grinzane Cavour , a little town gathered around its beautiful castle, aka the headquarters of the Piedmont Regional Cellars. A trip for gourmet, among famous wines, toma (a kind of cheese), meat dish good for a winter night when the wind is outside, blowing and whistling its voice against the vines. Monforte d’Alba is a stunning viewpoint over the legendary “land of wines” beloved by the Italian writer Cesare Pavese: an interrupted strings of vineyards spread all over, descending graciously the hills, which you go through to get to Barolo, a town well-known for its lovely wine and for other gastronomic specialities like the Brasato al Barolo we already talked about in a previous post. La Morra is another great viewpoint of the Alps, Monviso and Alta Langa. The seventeenth and eighteenth century cellars of the Benedictine abbey in San Martino di Marcerasco are worthy to visit as well as Cherasco, a medieval town surrounded by walls in the shape of a star!!! The Baroque Bra with the elegant church of Santa Chiara , the parish-church of Sant’Anna and the Traversa Palace and a funny museum: the Toy museum with its rare and unique, pieces on display. This entry was posted on Tuesday, October 30th, 2012 at 7:33 pm	and is filed under Discover Italy. You can follow any responses to this entry through the RSS 2.0 feed. You can leave a response, or trackback from your own site.